Downfall is a 4-track EP from alternative metal band hailing from Pennsylvania. From Ashes to New is a six-piece band that is trying to reinvent and modernise the rap/rock genre, successfully! One of the lead vocalists of the band, Chris Musser, has stated that he finds it embarrassing when he tells people that his band plays rap/rock. However, this should no longer be the case as if this EP is already on such high quality then I can’t imagine what their debut album will be like. What is special about this band is that they aren’t just mindless metalheads trying to cram as many metal licks into their music as possible. It is clear that they support positivity through their encouraging lyrics that have substance and weight behind the words. This is especially evident in the explosive title track Downfall. Stand out lyric is ‘After it all, we are the ones who suffer the downfall’. The introduction to this work of art brings to mind your favourite A Day to Remember track and if that isn’t enough once the vocals start, you realise that your favourite A Day to Remember track just had a lovechild with your favourite Falling in Reverse track and it’s called Downfall. Downfall absolutely exceeds all expectations and it is insane to think that it came from a band that doesn’t have an album yet. Lost and Alone is the only track on the EP without rap but that doesn’t mean that it’s lacking in anything. In fact, Musser’s vocals absolutely shine throughout the whole song. One of the highlights from the whole EP is on this track and is the breakdown at the bridge when the continuous singing is broken up by the introduction of some screaming vocals. This gives the song an added punch and lifts the song’s energy to an impossibly higher level. The next track, Land of Make Believe, is not as exceptional as the two preceding ones. It is probably the weakest track on the EP but that doesn’t really mean much as Land of Make Believe only misses the mark by a hair. The only reason for this is that coming after the two best tracks on the EP can only make it seem less vibrant and lively in comparison. However, the rap that is heavily featured on that track is spilling with passion and fervour and a good listen really allows the band to form that emotional connection with the listener. Overall musically, the EP is satisfying and never misses a beat. Generally, metal and rap/rock are for specific people like it’s an acquired taste that’s not for everyone. 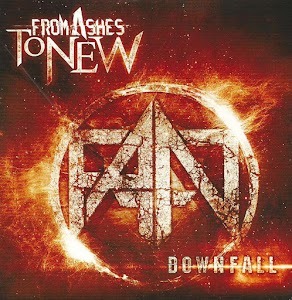 However, I would definitely recommend Downfall to those who don’t regularly listen to this particular type of music. This is because the choruses in all the songs are so goddamn catchy that after listening to Land of Make Believe once, you’ll be humming the melody for the rest of the day. There is something approachable about the music From Ashes to New that makes it accessible to anyone. Perhaps it’s the uplifting and empowering lyrics or maybe it’s the tunes that you can’t help but immediately like. Either way, this young band is already starting to blow up and is definitely going far.